The MSS Global Enterprise (MSS GE) is a complete turn-key security system intended for large Enterprise or Government networks, and includes advanced Malware/Botnet detection, Intrusion Prevention, Log Management/SIEM, and integrated vulnerability assessment. The MSS GE controller can be deployed either as a high performance Appliance (starting at 1200 Events/Second) or as an Amazon EC2 instance (AMI). 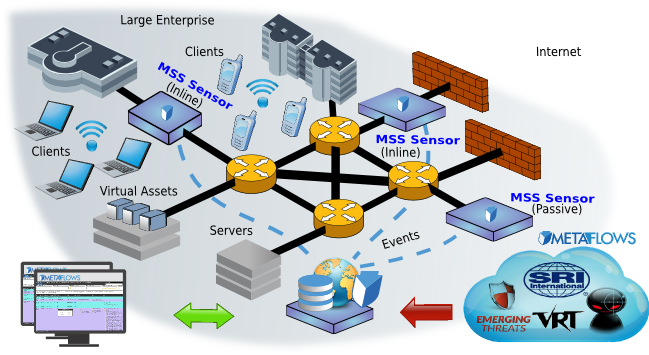 The MSS GE sensors can be easily provisioned on off-the-shelf hardware (up to 10 Gbps per sensor) running Linux CentOS/RedHat, high-performance Appliances, VMware or on Amazon EC2.